November 1st marks the start of the annual NaBloPoMo (National Blog Posting Month), which is the perfect way to get me into blogging when I feel I begin to get too busy for it. Anyway, I’ve been in the process of unpacking all the boxes I shoved in my office room closet while Joshua has shifted his focus to the garage. Last weekend the goal was to clear enough space for me to park in there. Sure enough, he did! 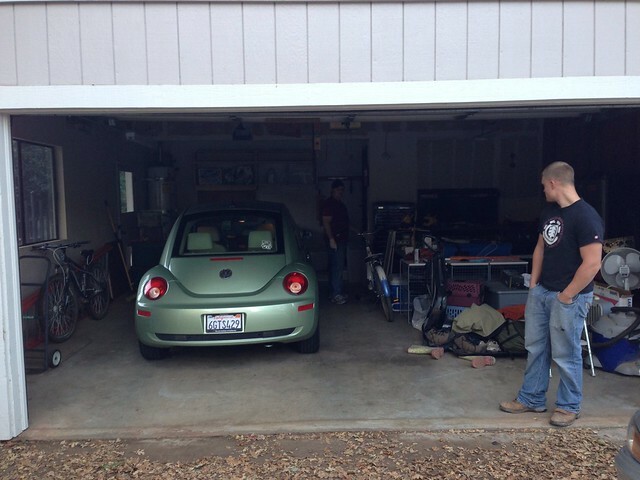 When we moved, everything went straight into the garage, and then we began moving things inside as we got rooms painted. Now that there’s only the guest room and a few walls in the entertainment room to paint, it was time to move things inside. Plus, it’s been raining off and on lately, and I wanted to make sure Tucker had a spot to hang out in the garage while we’re gone at work. Now that things are going inside, Joshua has been busy fixing sheet rock and getting ready to paint the garage. The goal is to get that painted as well as the guest bath and entertainment room before Thanksgiving. Here’s hoping we can make it!